Hot day today, ca 35°C so I keep this Post short and sweet. We decided last minute to go to the Batu Caves, just North of the City. 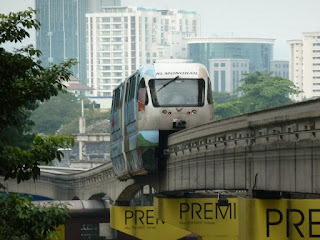 It is easy to get to (once you know how) just a train from KL Central Station. Afterwards we went on to the Monorail, which we really enjoyed and if we would not be flying to Langkawi tomorrow, we would definitely go on again. A lot of times we found it quite difficult to access certain places by foot, due to dual carriage ways and or missing pavements, so the best way round is by public transport. If you have any questions, just contact us.